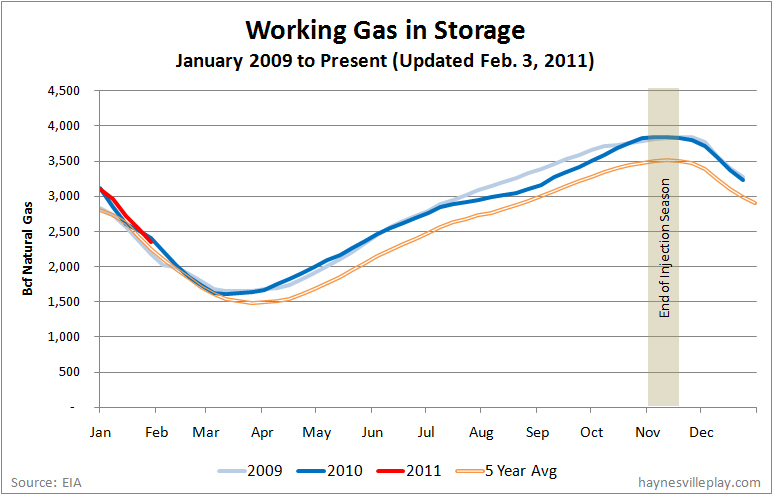 With the chilly winter weather last week, gas in storage was down more than usual last week. 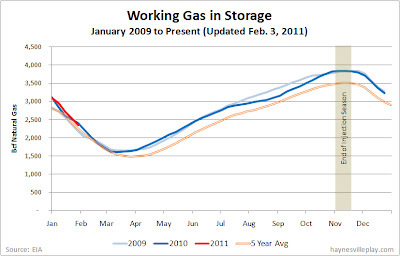 The EIA reports that the weekly storage level declined 189 Bcf to 2.353 Tcf. The weekly withdrawal was 70% greater than last year's withdrawal (-111 Bcf) and 15% higher than the five year average (-165 Bcf). 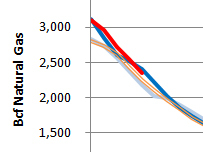 The current storage level is now 69 Bcf below last year's level and only 5 Bcf above the five year average. Lest anyone get too excited, I understand that the furry participants in yesterday's Groundhog Day are predicting an early spring. As expected, the average temperature for the Lower 48 last week was 30.1 degrees, 8.8 degrees colder than last year and 3.3 degrees colder than the five year average. As the map below shows, compared to historical averages, temperatures were warmer in the west and colder in the east.